Happy Friday, everyone! Last weekend, I informed Tony of some big news, so I figure it is time to let all of our readers know as well. After much consideration, my wife and I have made the decision to move up North, back to my home state of Michigan. If all goes well with the sale of the house, we should be headed up to the Upper Peninsula by late June or early July. But don’t get too excited, you won’t be getting rid of me that easy. I will continue to write regularly for Casas Fumando. Now back to business. 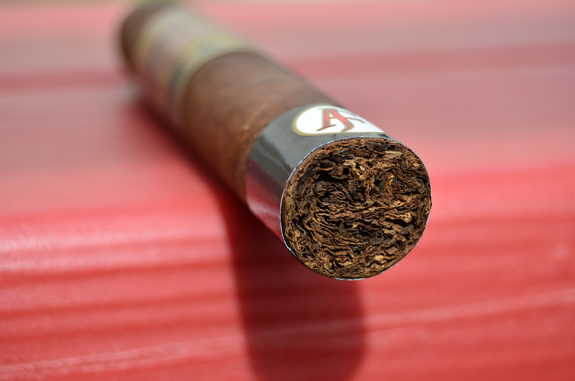 Today, I bring to you a review of the A.J. Fernandez Mayimbe. The Pennsylvanian broadleaf is the biggest thing to point out. It’s from an Amish co-op. We get to pick what we want every time. It’s a pretty sweet deal, because it yields some really strong and unique tobacco that most people can’t get their hands on. It’s straight out of Lancaster, PA, son! Upon removing the Mayimbe from the cellophane, I find a pungent wrapper aroma with notes of barnyard, vinegar, wet earth, and a mild sweetness. The Pennsylvanian Broadleaf wrapper looks amazing with its medium brown color. It is not nearly as rustic looking as I have come to expect with Broadleaf, specifically Connecticut Broadleaf, but you can still easily see all of the characteristics of the leaf, which I just love. Just a few medium sized veins run across the wrapper, which has a nice coat of oils that can be felt on my fingers. Bringing the foot of the cigar to my nose, a sharp black pepper spice instantly hits me and I am having to fight back tears. Along with the spice, there is a deep earth, almost dirt-like smell, and cedar. The triple cap has been applied very clean. The cold draw is free showcasing rich cedar and tobacco. A very welcoming cold draw. Starting off, the Mayimbe already has a lot of depth with rich notes of cedar, some earthiness, and a huge blast of pepper that can be felt in the back of the throat. The finish has a lingering cocoa flavor that is quite enjoyable and the spice warmth hangs out for a good length of time. At the half inch mark, the flavors are balancing out and there is an added toasted bread-like flavor. The burn line is steady and even, leaving behind a salt and pepper ash that is holding to an inch. The flavors are in the full range and strength is a solid medium. The pepper has stepped up its game and it is right in the front of the profile. 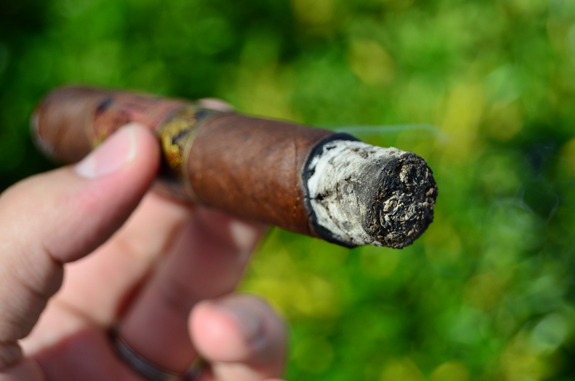 This is one spicy cigar. 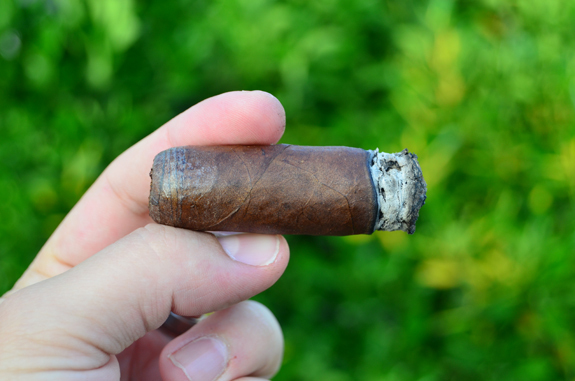 The toasted notes have also picked up and the earthy quality has become diesel-like. There is a faint, thick sweetness in the profile that hasn’t fully shown itself, maybe a syrup or caramel flavor. The pepper is a bit too much for me on the retrohale causing my sinuses to go crazy. The burn line is wavy at the close of the second third, which seems to be a result of a small crack in the wrapper. It should straighten back out once I burn pass the crack. The strength continues to move up and I am really hoping I will be able to stomach this stick. As I pull into the final third, a quick touch-up is required to get the burn back in-line. I don’t expect any other issues. The Mayimbe is producing an excellent amount of smoke that is somewhat thick and chewy. The cocoa from early on has made a return to the profile that has just the right amount of sweetness and richness to round out the profile. 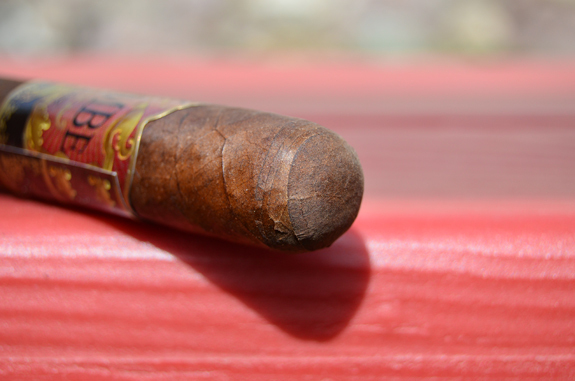 As the Mayimbe winds down, a saltiness and savoriness have emerged bringing a great ending to the cigar. 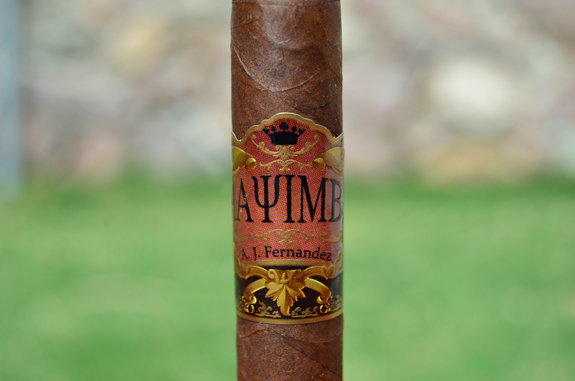 The Mayimbe is a slow smoking, full flavored, full strength cigar that takes you on a journey of deep, spicy flavors that are accompanied by notes of earth and cedar. While the cocoa sweetness played a minor role, it brought an amazing balance and roundness to the profile. This is a stick I can stand behind even with the higher price tag of $14. 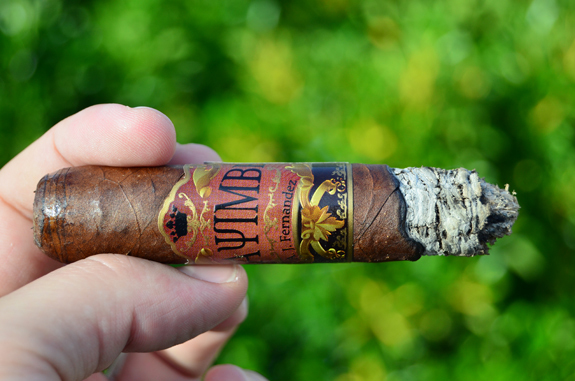 I do not think you’ll be disappointed in this cigar, which comes at no surprise considering the company responsible for the Mayimbe. If you have not got your hands on any of these yet, don’t wait any longer. 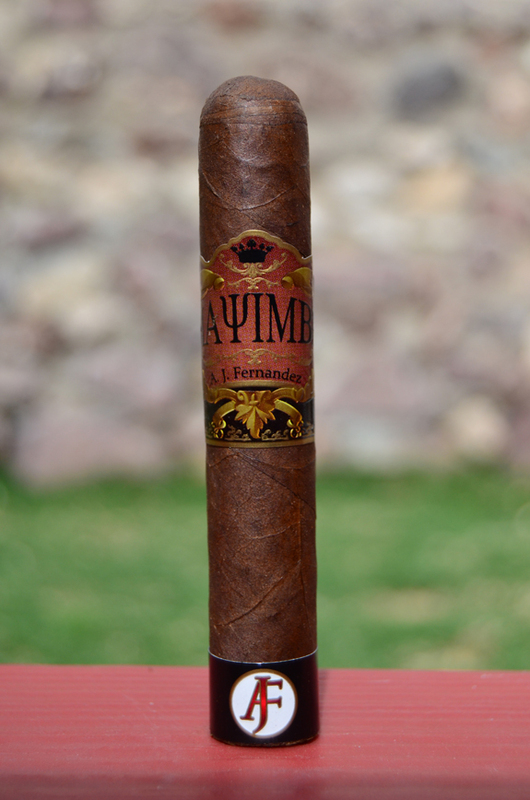 If you have had the privilege of smoking the Mayimbe, let us know what you think. Awesome! Have to try this one! Great review. Thanks for checking out the review! If you are an AJ fan you will definitely enjoy this stick. Let us know what you think of it once you smoke one. I’m sure that you’re excited at the prospect of moving back to your home ground. Best of luck with that! I’m sure Tony will miss the hell out of you, though. Sounds like a great stick, even if the price is a little high for me. Hey, man! I hope all is well in the Northwest. Yes, sir. We are very excited for the move. Not looking forward to the cold winters though! I guess I’ll miss Tony too. Actually, lots. For only knowing the guy a couple years, I consider him a dear friend. But with Today’s technology, we will be able to stay in touch pretty easily.